Iconic Moto Razr to Make a Comeback? At a time Motorola was not doing so well globally, other manufacturers were designing flip phones which looked fancy and carried a certain ‘wow’ factor with them. Then came Moto Razr in 2004, which crushed sales of nearly every other phone in its category and emerged as a legend. Almost every high school and college student purchased the first phone in the series, Moto Razr V3, simply because not only was it extremely stylish, it was super thin and range of features not available in competitors. The Razr also broke all records with sales of nearly 130 Million units over the four years of its existence. Who wouldn’t love to own that phone again in this age of large-screened smartphones? Lenovo has teased a possible relaunch of the clamshell phone at Lenovo Tech World to be held on 9th June 2016. 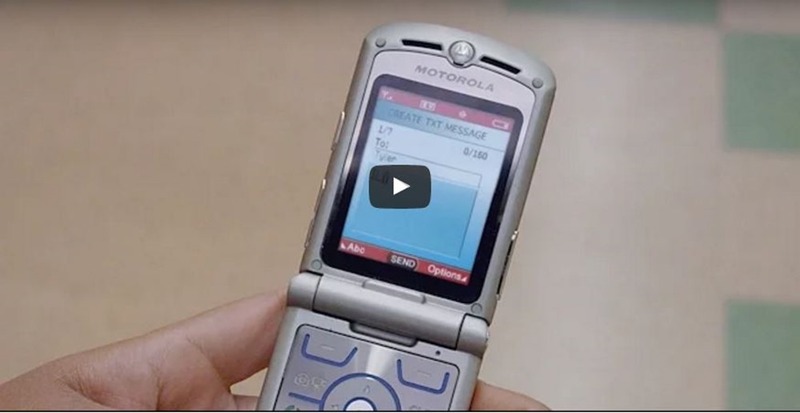 The teaser video is a revisit to a high school with nearly every teenager using a Moto Razr flip phone. It is quite possible they are taking us back in time just to give a sense of what we could see at the event, but it is likely Moto Razr would be relaunched with much better specs but the same iconic clamshell body. Why was Moto Razr discontinued and what could the new phone offer? After a launch in 2008, the first version V3 was an instant hit amongst the youngsters for a sharp profile and nearly 180 degree flip. The handset was also the thinnest at that time and came with an aluminum body. Subsequent iterations were released and the company launched the V3i to improve the shortcomings in V3. There was an improved camera and battery but the overall specifications were much the same. Then came Razr2 which had further enhancements like thinner profile, larger screen, touch sensitive external buttons and better processing capability. This was the last Razr phone to see the light of the day with the entry of Android and iOS devices. In these four years, Motorola gained a lot of popularity and the phone could be seen in a lot of commercials and being donned by celebrities. Motorola released some phones in 2008 and 2009 on the lines of the phone but did not garner as much popularity as the flip phone. In case Lenovo is planning to bring back the model, they should look at powering it with Android without changing the overall look and feel of the phone. Samsung released the Samsung Galaxy Golden in 2013 which was a flip smartphone and had a design reminiscent of Samsung’s flip phones. The hybrid smartphone failed to impress the public and it was priced extremely high for the features in offered. The new Razr could have a 3-inch screen, be as slim as it was back in 2004 and have features like those in the recently launched Moto G4 Plus. It is ,however, really difficult to assess the public’s reaction to a flip phone at a time when smartphones are everything for a person. We’re looking forward to the event next month and will be updating you with any speculations and leaks before it. "Iconic Moto Razr to Make a Comeback? Lenovo Teases the Flip Phone in a Video", 5 out of 5 based on 1 ratings.